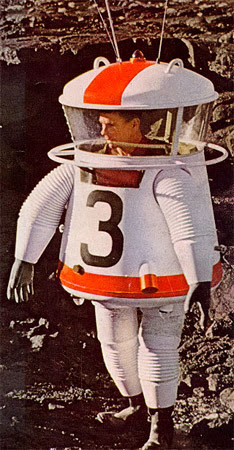 Some time ago we referenced the Jean Dolecki incident, under the perspective of the Distortion Theory We have recently found information that might be be the psychic "origin" of the strange humanoids observed by the witness Perhaps he saw a LIFE magazine article with photographs of astronaut suit designs (illustrated below). On January 9, 1976 about 19:15 pm, Jean Dolecki driving his car by the D71 in the direction of Pont en Royans, when on the road to St Just de Claix, he observed a bright, white object of spherical shape. The artifact increased in size and appeared to be descending. Thinking he might collide with the strange object, the witness stopped his car. The artifact landed about 70 meters from the car. The object had a curious shape, looked like stainless steel and had two truncated cones of different sizes joined at the top. Its height was about 10 or 15 meters, and on its top it had three lights (red, white, beige). On its sides were two vibrating elements similar to rotating propellers. On its upper part there was a supplement that seemed to vibrate the same way. The witness observed a door and under it there were three dark horizontal lines. From the lower part of the object, which was floating about a meter above the ground, came a bright, white light illuminating everything. The object was hovering about 1 meter above the ground. 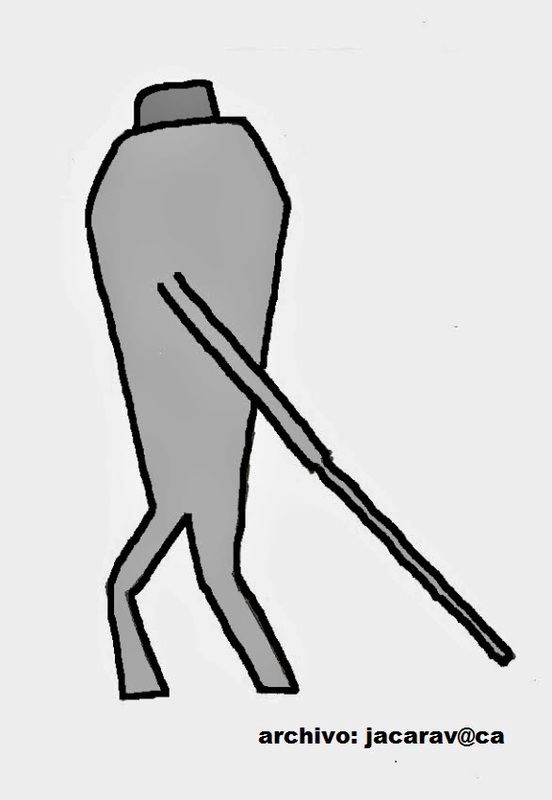 Suddenly the door opened, and the witness observed three figures. 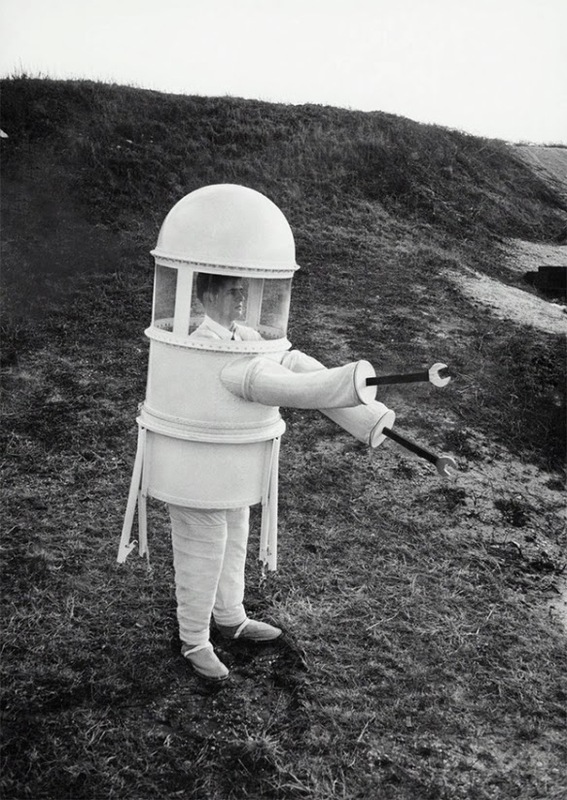 The humanoids had a long telescopic limbs as arms ..
American pressure suit, tested in 1966. 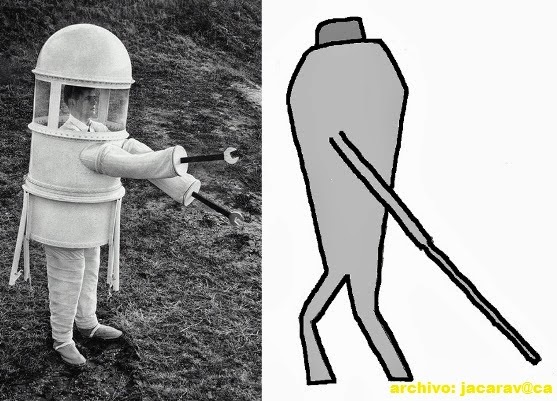 This Republic Aviation design for a hard space suit was designed for extended operations on the lunar surface and appeared in LIFE magazine in the 1960s. 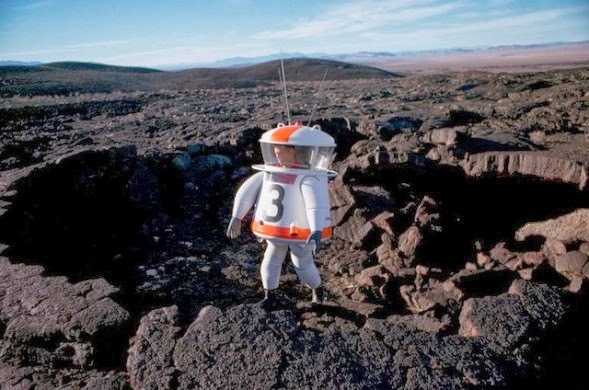 Mr. Dolecki saw astronaut image before his experience? The artifact ascended at an angle and sped away towards St Jean en Royans. The inhabitants of a farm located 200 meters from the place of observation, experienced strange interference on their TV at the same time of the encounter. That same day, another person said they had observed a curious light at Léoncel.